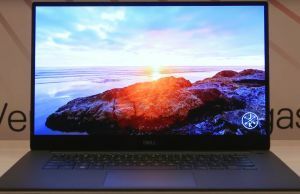 I originally reviewed the XPS 15 9570 (FHD) in June of this year, scoring it 4/5, so if you haven’t read my original review, I suggest reading that first here. Too often, products are reviewed in the first few weeks of release, assigned a score, and never touched-on by media again. This blind spot means that the daily experience of the average end-user may be wildly different than that of the reviewer. There’s no general aim of misdirection intended; it’s just the result of tight deadlines and the fact that we can only use so many devices at once. In this case, however, I am able to report on the XPS 15 9570 as I’ve been using it daily for the last 3 months. In light of these experiences, I would like to share my observations about the device and how I would rate the product after spending hundreds of hours on it. I originally reviewed the XPS 15 9570 (FHD) in June of this year, scoring it 4/5. The 4K XPS 15 still has the best display I’ve seen on a laptop. The resolution, color accuracy, contrast, brightness, and evenness on my unit strike me every time I use it. The CPU performance is still excellent (especially after an undervolt), posting numbers 15-20% higher than your average i7 or i9 15-inch 2018 MacBook Pro. Battery life is generally quite good, hitting 8-9 hours on a full charge without worrying too much — in fact, I don’t believe I’ve ever run out of juice on a single day of work since I’ve had the notebook. The TrackPad is very pleasant to use, and the keyboard is quite decent as well. It’s no ThinkPad, but I can type quite comfortably on it for long periods without feeling fatigue. Lastly, port-wise, I appreciate having both Type-A, Type-C, and SD card ports, meaning I don’t need to bring adapters with me everywhere. About 3 weeks after getting my XPS 15, I noticed an occasional rattling noise coming from the left side of the computer. It was intermittent, only noticeable at lower RPMs and only when the GPU was active. After examining the fan, I diagnosed it as a bad bearing, called Dell, and 2 days later a tech came to swap the fan for a new one. No fuss, no muss, no downtime. I would have been more annoyed had I not had the next business day premium warranty, however — something I have learned to never skimp on. Unfortunately, there are a host of issues that have popped up and remain unresolved for the XPS 15 9570. Some of them are specific to the 9570, while others have plagued the whole series for years. The first of these is what is known as high DPC latency, and has been well-documented on the XPS 15 series for years. DPC stands for Deferred Procedure Call, and it is used to set the priority of different tasks for execution. A high latency is a problem primarily when playing audio, especially in real-time, because it results in crackling and popping audio. As a DJ, this is job critical, but it’s also very disruptive to the average user who just wants to play media through the built-in speakers. Dell seems to be aware of the issue (caused by ACPI.sys), but there is no fix as of this moment. There are some workarounds, such as toggling Spatial Sound on and then off again, but nothing fixes the problem for good. 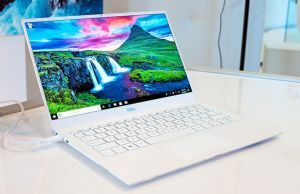 This means that playing live audio from the XPS 15 is a no-go, precluding musicians, producers, or DJs from using it for professional purposes. 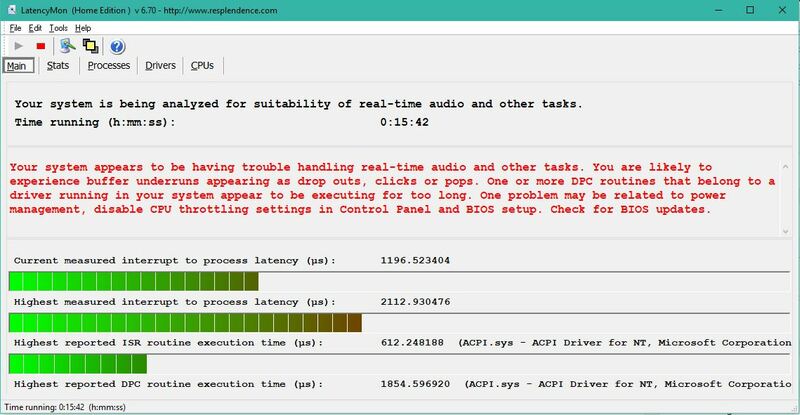 High latency on the XPS 15 9570 causing audio issues. The second biggest issue I’ve noticed is the generally non-functional state of Modern Standby for this machine. Dell originally shipped the XPS 15 9570 with both traditional (S3) Standby and the newer phone-like Modern Standby. The first problem is that Modern Standby is broken: Every time I put the machine to sleep, I take it from its sleeve some time later to feel the chassis is quite warm, and upon waking it, I can see that I’ve lost somewhere between 2-10% per hour. Other times, the machine simply doesn’t wake up and needs to be hard-reset. I’ve tried to diagnose what might be causing this, first replacing the included Killer Wi-Fi with an Intel 9260 card and then running sleep diagnostics, but I’ve received no answers. This is made worse by the fact that Dell removed regular (S3) Standby in BIOS update 1.3.1. As I noted in my original review, using “proper” Standby resulted in some bugs and glitches involving the screen and the CPU. Rather than fix these bugs in S3 Standby, Dell decided to remove the feature altogether, forcing everyone to use the completely broken Modern Standby. The current situation essentially forces anyone who needs to conserve their power throughout 1-2 days to hibernate their laptop every time they are not using it. Lenovo’s flawed X1 Carbon Gen 6 had similar issues with Modern Standby, and so returned the option for traditional Standby in a recent BIOS update. In comparison, Dell’s handling of the problem thus far is unacceptable. Even worse, from BIOS 1.31 update onward (currently at 1.4.1), Dell quietly began throttling the GPU at only 74C rather than the 78C the machine previously was limited to. I will try to be fair and assume this is not out of malice and manipulation of early benchmark scores and instead guess that perhaps there was another reason for this change. However, there was nothing mentioned in the BIOS update notes about this and no reason for the change was given. 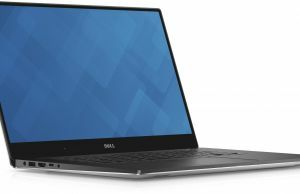 Since the XPS 15 9570 is a thin and light notebook, the GPUs have always run quite close to their prioritize temperature of 78C. Cutting this temperature limit down to a very conservative 74C will significantly impact the performance of the GPU as a result. Additionally, the 1.4.1 BIOS — which cannot be downgraded from — seems to have introduced yet another severe bug: the touchscreen stops functioning after the laptop is put to sleep. To get this functionality back, the laptop must be restarted. A final annoyance is that the CPU seems to have issues with idle power consumption. Instead of idling at around 0.7 W as intended, the CPU is often found to be unable to enter a lower C-state for some reason. The result of this is the CPU idling at significantly higher levels of power consumption, between 2.8-4.0 W. This has a significant negative impact on both battery life and idle temperatures, as it increases the idle drain from what should normally be 6-7W to 12-14W total system-wide consumption. This can be temporarily fixed by putting the computer to sleep and waking it, but it will happen each time the laptop is restarted. I’m not sure if this is a Windows problem, Intel problem, or Dell problem, but at the end of the day it’s Dell’s product that I paid nearly US$2500 for, and the ball is in their court to make the product work as it should. These last two issues in conjunction lead to an almost farcical reality: the XPS 15 9570 now must be put to sleep in order for the CPU to properly enter low power states, but doing so will break the functionality of the touchscreen. Dell can and should do better to iron out these issues, and I hope that we can see some progress in this area in the next few months. In the meantime, I will be giving the new ThinkPad X1 Extreme a shot, so keep an eye out for my review where I match the X1E up against the XPS 15. I am in the market for this laptop and surface book 2 15". I am getting both for around same price, but surface book 2 is a open box with little base scratch. Which one would you recommend based on your experience? I cannot recommend any product as expensive as the SB2 that cannot be upgraded or repaired by the user. I would go for the xps. Even if it is for the same price as the XPS 15? What about about the absence of a numeric keypad? Or are you just one to use a laptop for 'work' that does not even need inputting numeric information? I'm not sure what to make of your tone here about numbers, tbh. As I generally write probably 1 number per 500 words, I much prefer a centered keyboard on a laptop. It's just painful to use an off-centered keyboard on my lap. If I need to enter a few hundred columns of data for some reason, I'll use one of my desktops. "hundred of columns of data for some reason" – this overkill would require and 90's style data-entry logger or something, thanks but no thanks. I apologise for the tone, even if the intent is certainly not to vex – I am so happy to see someone actually reading and replying to me! If you write only 1 number per 500 then it's just text and you don't really need a powerful thing like XPS for your 'work' – it's only text that can be handled by any other computer/laptop, actually. It was very kind of you to reply to my comment, so, thanks again so much for your time, Sir. I apologize for taking it that way! I've been too exposed to macrumors forum arguments about what constitutes "real" work! I can understand the need for numpads for some people, it's just personally i don't like the appearance and the offset nature. On my aero 15 i put my hands into the wrong home keys probably 50 times a day because of it, and it drove me crazy! Agreed on the off-centre placement of the trackpad, but I've managed to do with it by placing my index finger on the J key instead of the middle finger: hope this helps. And again thanks so much for your time in replying! Keep it up! I always hope for these long term types of reviews and rarely see them – so thank you! I would be very interested in a six month update as well (although in my opinion not solving the high dpc latency and power state flakiness three months after release for a flagship product is pretty disappointing). Have you done a full system wipe, and reinstall of windows without Dell bloatware? Has the nvme or ssd been set to achi in the bios? Have you been updating the other system drivers besides the bios? Intel, Nvidia have had very recent updates. I have done a full clean install, changed ssd to ahci, and always run the latest updates from Dell. Sir, do you had any chance to verify eGPU performance using latest drivers and bios? I've heard that some improvements were made by Dell regarding this functionality. Performance does seem a bit more consistent in Prey and some other games, especially in terms of low framerates. I can't quantify it, however. The fan curve on the XPS 9570 needs fixing, many of the solutions Suggested too generic. Putting it on quiet doesn't work, disabling turbo boost doesn't work. A quick way to test the issue is to press F12 on boot up, go to Dell Diagnostics – "ePSA Pre-boot System Assessment). From there look at the System health and you will see that temps never get past 49C, and the fans keep cycling from 0 – 2504 RPM. It does this every 20 secs or so. This eliminates any concerns about windows running something it shouldn't. Thank you very much for this review! Very instructive. The fans are a nightmare, constantly spinning up and down on my machine. The headphone jack has some wonky interference when no audio is playing. The machine wont go into standby on Ubuntu. the track pad has a mind of its own a lot of the time and copy pastes all over the shop. Douglas, for those of us who are anti-Mac, what would you suggest for audio? I actually just ended up returning my XPS 15 for the reasons you have listed. I wish I had found your review much sooner. I had mine for 3 weeks and used it maybe 7 times. I went to turn it on one day, and it struggled a bit. I plugged the power cord in and it finally turned on. I assumed it was low battery, thought nothing of it. I worked for a bit, closed the lid and went for a nap. When I returned, I tried everything to turn it back on. The backlight on the keyboard would do a quick flash, but nothing would happen. After spending an hour trying various things, I called Dell. They told me it was a motherboard issue and would send someone to repair it. Needless to say, I was extremely displeased. I thought rather than going through a repair process and not knowing if the same thing would happen again, I returned it before my 30 day window was up. I really did love it up until the crackling speakers and this. Mr Black, which alternative(s) would you propose for long term use, Sir? No leo nada mas que disgustos acerca de esta Dell en diferentes foros. I do not read anything but dislikes about this Dell in different forums. Excellent review. until now the issues remains? Any thermal throttling? For performance laptop with gaming capabilities, do you still recommend that Lenovo X1E? I think the x1e is more reliable overall. Throttling temp of the GPU is not both 74 and 44c like in the xps, and the xps 15s constant issues with standby. I have little faith in Dell's support of the xps 15 overall. thanks for the detailed and long-term review! 1) What happened after bios 1.5 update, any improvements to solv some issues? 2) ignoring the price, should I go with xps or x1 extreme? I no longer have the machine to test, but I hear there are two issues still: the GPU throttled BELOW a certain temperature (44C?) AND ABOVE 74C. That means the clocks will get locked down if it's not only too warm, but too cold. Absolutely absurd. The X1E will be the better buy, especially during Black Friday if you can get one from the US. Is this the only remaining issue? Gpu throttling with temp ranges? Should I cancel my order for a work laptop? Saw this after purchase, hasn't shipped. I have been using the XPS 15 9570 for about 1 1/2 months now and it's been fantastic. I am running into issues though where it seems to stall or hang up a bit, especially when switching folders or working in Outlook 2016. To be fair, I have a couple dozen windows open and Firefox using up 5 GB of RAM, but that's how I work. Lenovo had 30% off ThinkPad's for Black Friday. I ordered a custom X1 Carbon Extreme with 32GB of RAM in one slot, leaving the second open for another 32 GB another day. 1 TB SSD, i7 – same as in the Dell. I'm now growing attached to this Dell though and am not sure what to do. I have until the end of January to return either, and look forward to trying out the ThinkPad. What do you think? I read your review comparing them, but how do you really just feel, gut instinct? I think you are in a good position since you can try both. Give the x1e a week and see how you feel about the overall experience. Imo it's just a more refined machine, but it's all down to your feeling. Any conclusion after trying both laptops? I actually talked about this in our first podcast a few weeks ago. I got the matte 9570, does cleaning the screen with LCD cleaning products would wipe the antiglare off? I was thinking of getting this laptop next, thank goodness i stumbled to reddit and found the post there. Reading this review honestly saddens me. I really like the laptop, but these issues are things i cant just undermine. Are these issue still occurring? Do you have any suggestion as an alternative to xps 15? I was thinking of Asus Zenbook UX533. or do you have something for me? The issues such as GPU throttling and no real sleep are still present, I'm afraid. For alternatives to the XPS, I would really only suggest the X1 Extreme at the moment. Hopefully you can find one in your country without being forced to pay an exorbitant price! Thank you so much for replying. I have read countless reviews in the past hours and this really gave me new things to think of before purchasing. I don't like the look of the Thinkpads, it's too "professional" looking for me. Is there a release date for the 9580 yet? It might be worth it to wait. I need a laptop soon, but I want the best I can get since I will not be purchasing again in a few years. In my opinion there's nothing to be worried about looking "too" professional! But, if you are looking for the performance and upgradability and don't mind a bit less battery life and more weight, how about the Legion Y740? Good keyboard and build; better performance! The 9580 might be worth the wait, but my experience with years of the XPS 15 says that it will be plagued with issues, many of which will not be fixed. Y740 better than the X1 Extreme? Thanks for the follow-up to your original review. Just read both of them. 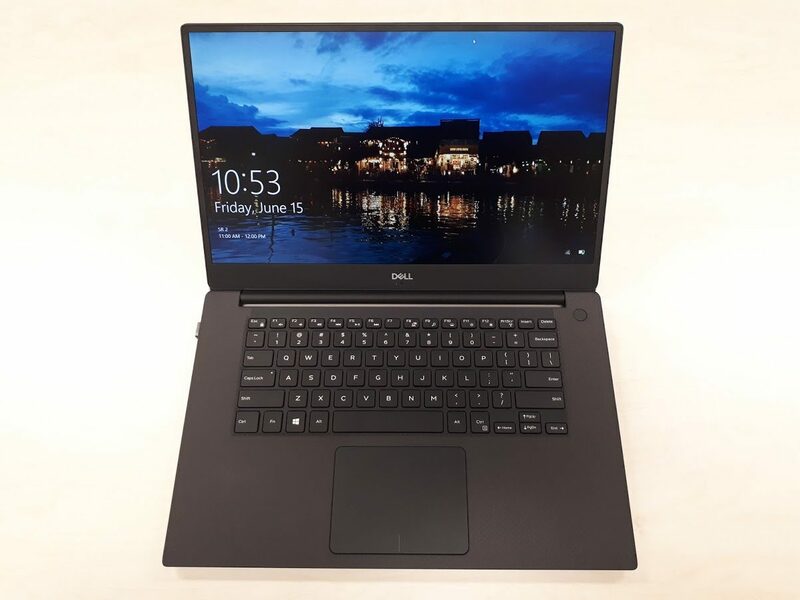 I do have an XPS 15 9570 on the way from the Dell Outlet: Got an i7-8750H, 16GB RAM, 256GB SSD, 1080p screen and GTX 1050Ti all for just $851(USD). While that is still a lot of money, I'd be even more pissed off if I had issues and had I spent twice that. You have definitely provided me with a good heads-up on what to watch for. I'm professional IT Network Engineer by day and I too am a DJ (albeit a retired one)? Are you running Serato? If so, how did it perform on the 9570? – Fixes the issue where the Windows BitLocker recovery prompt gets displayed when starting the system with a device connected to the Thunderbolt port. – Fixed the issue with the graphics performance where it becomes limited when the temperature of the system is low. – Fixed the issue where an unexpected warning message is displayed when a USB Type-C device is connected. – Fixes the issue where the Dell Thunderbolt dock is not recognized after updating the power delivery firmware. – Replaces Absolute Software service from Computrace to Absolute Persistence Module service. – Enhanced the supportability for BIOS attribute management through Windows Management Instrumentation service. – Updated Intel ME Firmware to address security advisories INTEL-SA-00125 (CVE-2018-3655), Intel-SA-00141 (CVE-2018-3657, CVE-2018-3658 and CVE-2018-3616) and Intel-SA-00131 (CVE-2018-3643 and CVE-2018-3644). – Improved sleep mode power management in Ubuntu. – Solved the intermittent issue where the system powers off from hibernation after adapter is plugged or unplugged. – Fixed the issue with touch screen where it malfunctions after closing and opening the lid. – Fixed the issue with missing characters while typing when system is in idle mode. – Supports wake from dock LAN feature. Side note: I've owned an XPS 13 from Dell Outlet since 2016 (paid $600 USD), and while it did have a noisy fan right out of the box, I replaced it quickly under warranty and it's been working great since. I just need something today with a larger screen for things like Serato, and bit more graphics power for light gaming on the go. I'll try to report any issues with the new laptop here. Those are definitely the price points to be buying this kit at! 1k or so and it's much more paletable to deal with ongoing issues. My XPS 15 kept turning off during sleep when I undervolted using XTU. I'm using throttlestop now and it never turns off when on sleep (just need to turn throttlestop back on after booting from hibernation). I still get the audio crackling and wishing there was a fix for it.